On July 9, President Trump nominated Judge Brett Kavanaugh to the Supreme Court. He was on a short list of judges to be considered for the highest court in the land. Kavanaugh is recognized as a conservative jurist (not politically but how one applies the constitution to cases). Immediately, Republicans loved him and Democrats opposed his nomination. When the confirmation hearings began on September 4, it was contentious to say the least. On September 9 an accusation emerged that Kavanaugh sexually assaulted a girl 38 years ago when he was 17 and she was 14. On September 17, Dr. Christine Blasey Ford, the alleged victim, testified that she was 100% sure that Kavanaugh was the person who sexually assaulted her. Later that afternoon, Kavanaugh testified that he was 100% sure that he did not commit this sexual assault. On September 28, a limited FBI investigation was ordered. On October 4, the FBI issued their report to the Senate Judiciary Committee. With a 50-48 vote, the Senate confirmed Kavanaugh to the Supreme Court on October 6. One democrat voted yes and one republican voted no. Kavanaugh is a supreme court justice today because the republicans hold a majority in the senate (period). Joe’s Perspective: I have intently watched this process unfold. One thing is perfectly clear to me. 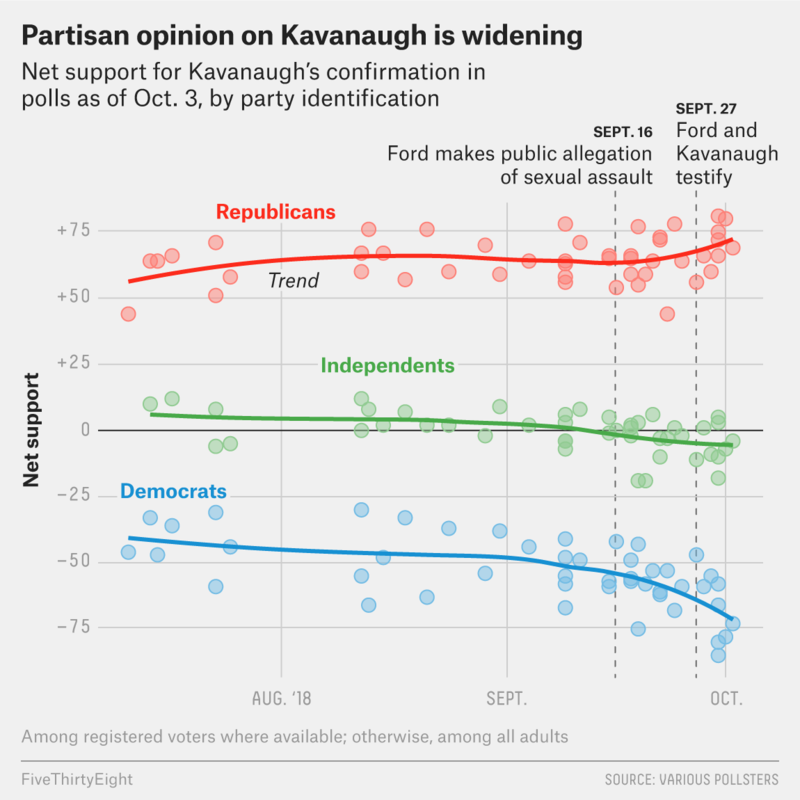 With little exception, republicans believed Kavanaugh should be confirmed and democrats believed that he shouldn’t. In fact, the only thing the sexual assault allegations did was divide us further by political lines (see chart above). If you turned on Fox News, it was exclusively pro-Kavanaugh and if you turned on CNN, it was exclusively pro-Ford. Politicians argued the point from their political viewpoints, sometimes screaming and pounding the table for emphasis. Likewise, my republican friends posted about Kavanaugh’s innocence and my democrat friends posted about his guilt. President Trump dismissed Ford and her testimony while late night hosts and Hollywood mocked Kavanaugh. It was all so predictable. The interesting part is that both sides felt, scratch that, knew that they were correct. Each sighted evidence that supported their biased conclusions. Their partisan views made them feel morally right and even righteous. Democrats don’t know if Ford was telling the truth, yet they were all united behind her. Republicans don’t know if Kavanaugh was telling the truth, yet they were all united behind him. My point is simple. 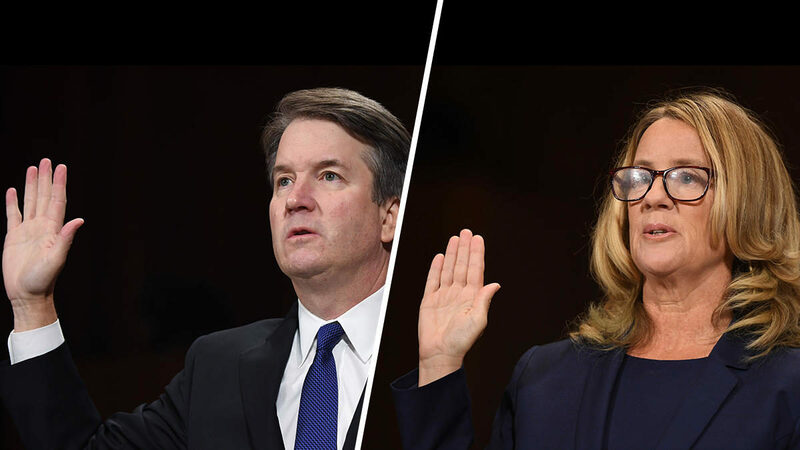 If the tables were turned (liberal judge nominated by a democratic president), the exact same democratic senators would be defending their nominee and the republican senators would be blocking the appointment. If you think I’m wrong, 1) study the Bill Clinton impeachment hearings – he was impeached by the House (majority Republicans) and found not-guilty by the Senate (majority democrats). On almost strict partisan lines, the democrats found him innocent, even with tapes, corroborating evidence and proof of lying under oath. 2) Keith Ellison, a U.S. House member and deputy chair of the Democratic National Committee was recently accused of physical assault by an ex-girlfriend with uncorroborated evidence. No #metoomovement uproar. No protests by left-wing groups. No 24-7 coverage by the media. You probably have never even heard the story. Joe’s Message: My message to young people is to think for yourself. Think critically. Be objective. It takes true character to listen to the other side, see past your own filters (whether that be politics, race, gender or class) and make up your own independent mind. The truth is we will never know what happened on that night some 38 years ago. Was she telling the truth? Was she lying? Did she mis-remember? Was this a ploy by the democrats? Who really knows? However, without conclusive evidence, the outcome was predictable. Republican senators were going to support Kavanaugh and democrat senators were going to oppose him, and the republicans had the majority. Right, wrong or indifferent, that is the state of politics in this country right now. Your generation can change this reality. I wish you luck. Your Turn: How will you be able to objectively look at the facts of a case and see past your own filters? Main point is, if you bring an accusation against somebody (democrat or republican) you need proof. That is how our society is based, innocent until proven guilty. Ridiculous how his life was defamed and destroyed based on her accusation with no proof.